2 games in 1 – Test your skills with an exciting new spin on basketball that everyone can play! Race the clock as you try to make as many baskets as you can. But in space you can’t use your hands to aim the basketball – you must bounce it off a platform that moves as you tilt the device. Use your quick reflexes to move the platform into place before the basketball drifts off into space. And, use the controls to make the ball more or less bouncy. It’s all about smart strategy if you want to get the basketball in the hoop! With high resolution 3D graphics, Cosmic Ball is an out of this world game you won’t want to put down. There are 9 thrilling levels to test your speed and coordination. Act fast because you can’t move to the next level until you make many baskets quickly. Earn bonus points for sinking the basketball from longer distances. 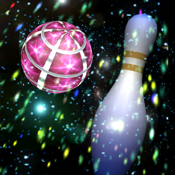 Try your hand at bowling in space – you also get a realistic bowling game inside Cosmic Ball as a special bonus. Zoom in to take a closer look at the pins. Then, choose your spin and let the ball roll! There are 10 fantastic pin sets to keep you playing. High resolution graphics and your choice of spin (clockwise or counterclockwise) make the game even more fun.